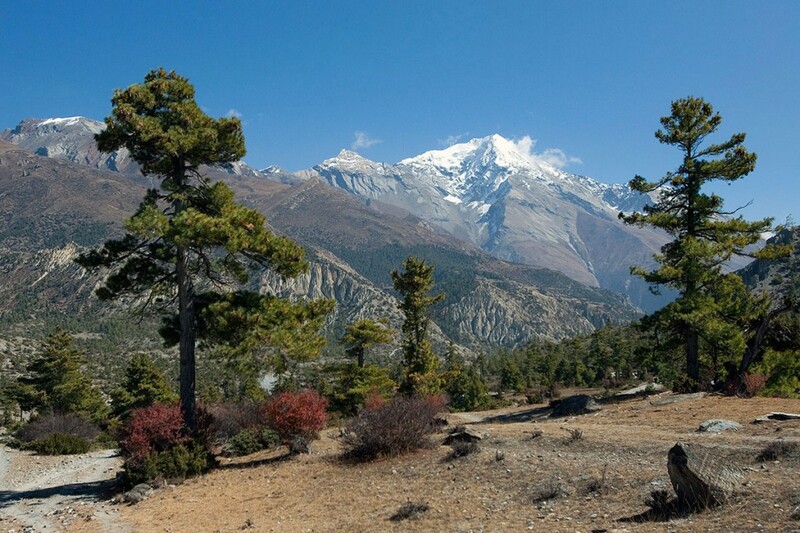 Nepal’s Annapurna Circuit Trek climbs from lowland villages surrounded by lush fields and forests up through the mountains into the arid trans-Himalayan region that lies on the edge of the Tibetan Plateau and then back again. 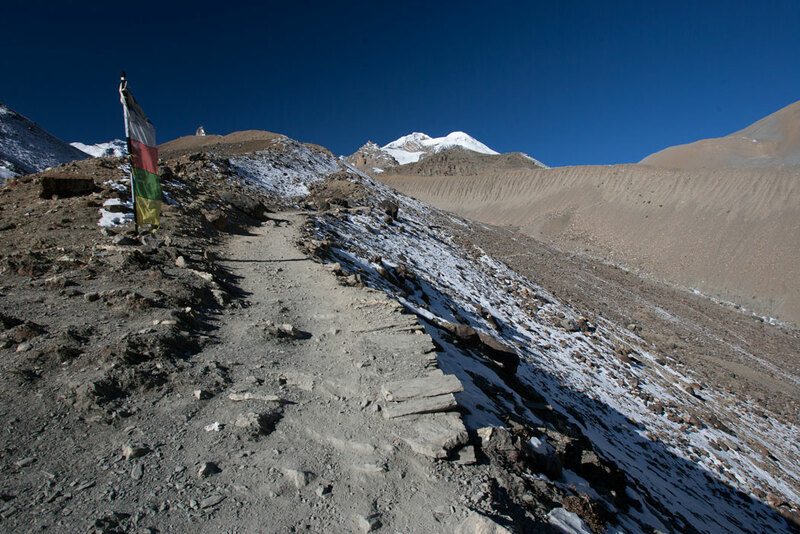 Many veteran trekkers still consider the Circuit the ultimate long-distance trekking in Nepal. Despite being very popular the Circuit is always done counter-clockwise so the amount of trekkers you bump into is limited to those you overtake or whom overtake you, ie you don’t keep meeting them head on. 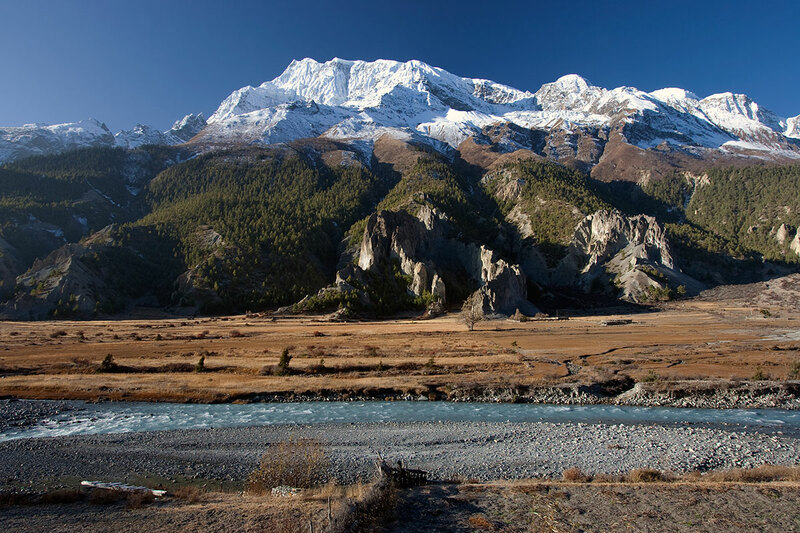 The Annapurna Circuit Trek encircles the Annapurna Massif, a collection of snow-covered summits, several over 8,000m, and trekking it you will cross a 5,400m pass, encounter glaciers, the world’s deepest gorge (on the final western side of the circuit), bamboo, rhododendron, pine, spruce, hemlock, maple, oak and other forests, rice paddies, tundra and ancient monasteries… and the views are terrific. 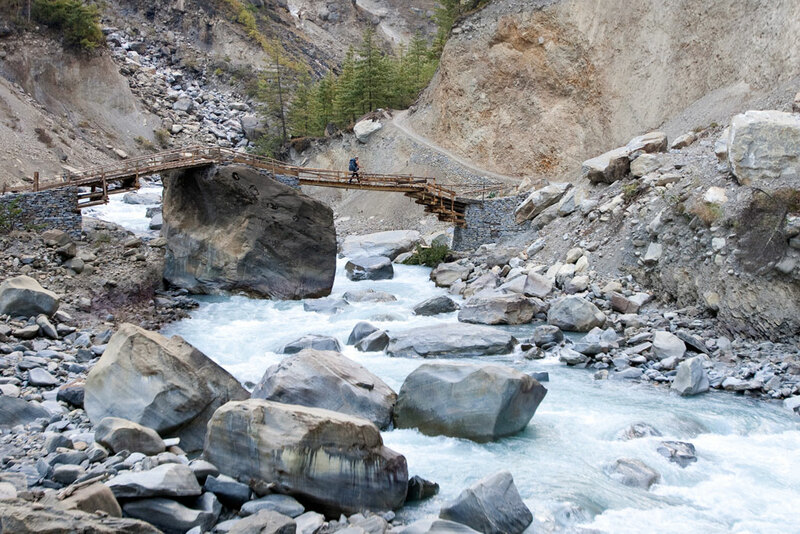 The trek starts up the Marsyandi Khola (river) and continues north up the wooded Manang Valley through Chamje, Pisang, Braga and other remote villages belonging to differing ethnic groups; predominately Gurung, Manangi and Thakali. 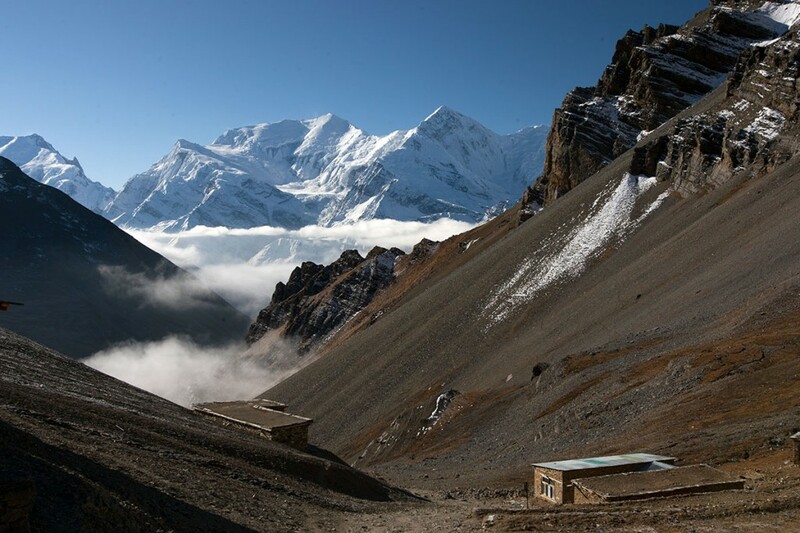 On the other side of the 5,400m Thorung La is a steep descent, from which you have great views of Dhaulagiri (8,167m), to the Hindu and Buddhist shrines at Muktinath (3,800m) and, the next day, the fascinating little village of Kagbeni. 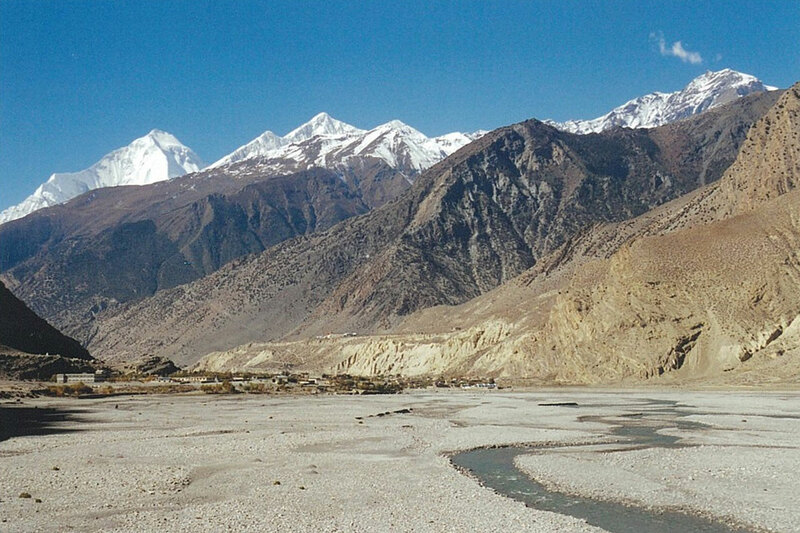 Most people now fly back to Pokhara from Jomsom, but we could still continue and trek down the Kali Gandaki Gorge, a rugged valley three times as deep as the Grand Canyon (from mountain top to river surface). This is a tea-house trek best done in October or November, though it could also be done from March to early May. It should also be emphasized that the itinerary below is an example and other villages can be stayed in each night depending on progress. 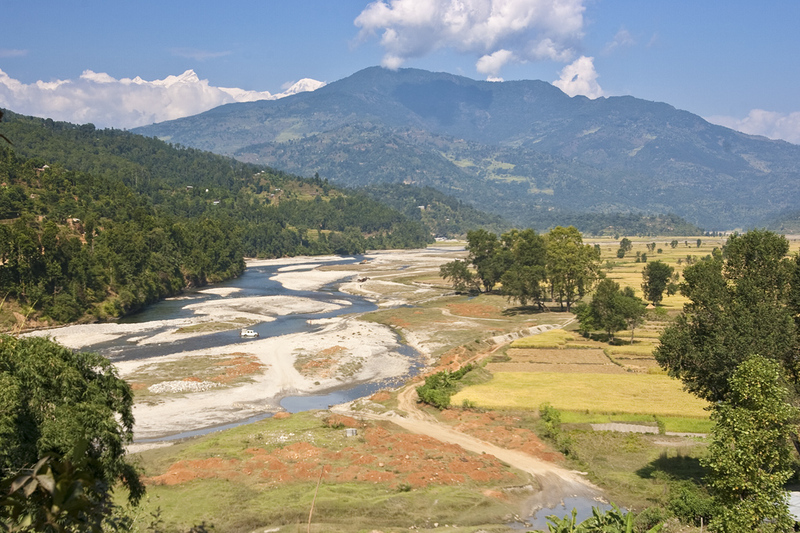 If you have an extra three days to spare then we strongly recommend starting with a trek across the Himalayan foothills from Manakamana to Besi Sahar via Gorkha and Tarkughat. This is both a fascinating hike that other tourists don’t see and a good opportunity to get fitter before you start ascending. Day 1 Kathmandu to Besi Sahar (830m) Your trekking guide will arrive and, after breakfast, will take you to Besi Sahar (6/7 hours). 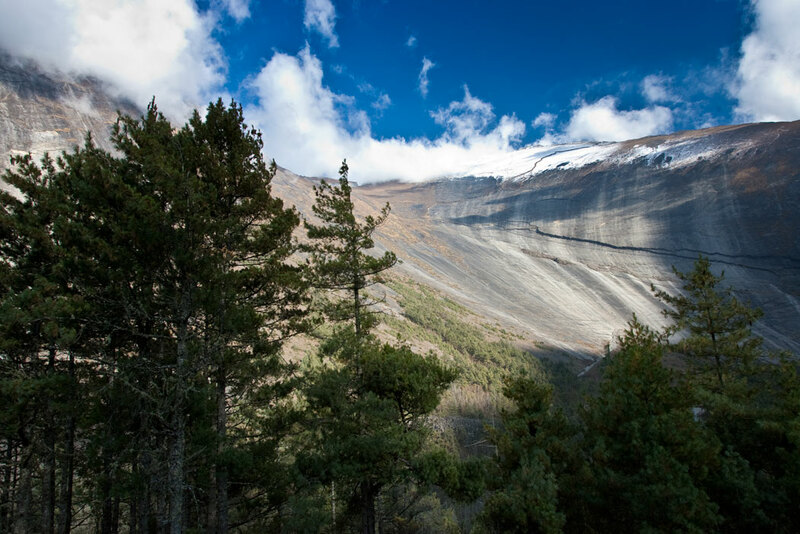 Along the journey you will witness some spectacular scenery; white mountains, green hills, rivers and hamlets. Day 2 Besi Sahar to Bahundanda (1,430m) Our first day’s trekking introduces us to the diverse cultural elements of Nepal and we hike past many typical local houses and the faces of varied ethnic tribes exchange greetings (namaste) as we pass. We share the trek with mule caravans that transport supplies to the remote villages. 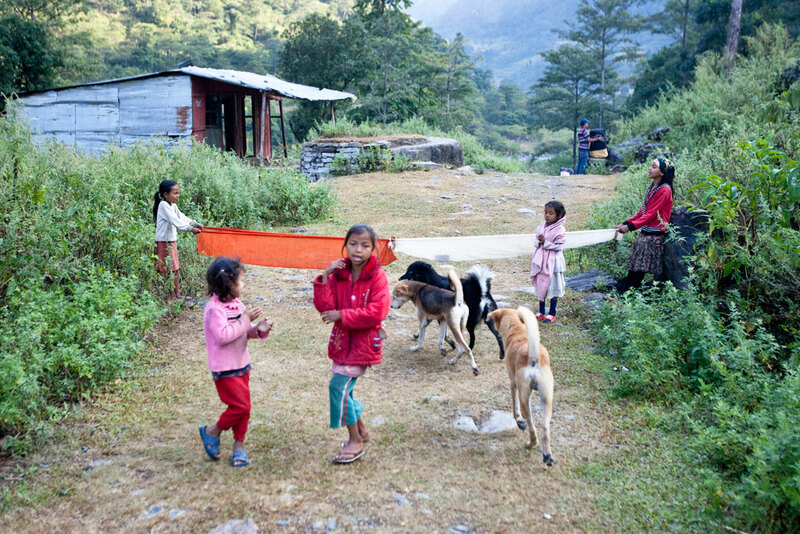 Our trek makes its way through subtropical forests and the rice terraces of Sera to the village of Khudi (840m) and we have views of Manaslu (8,156m). The mountain views disappear as we hike toward the small town of Ngadi, where we cross the Ngadi Khola (river) via a long suspension bridge. 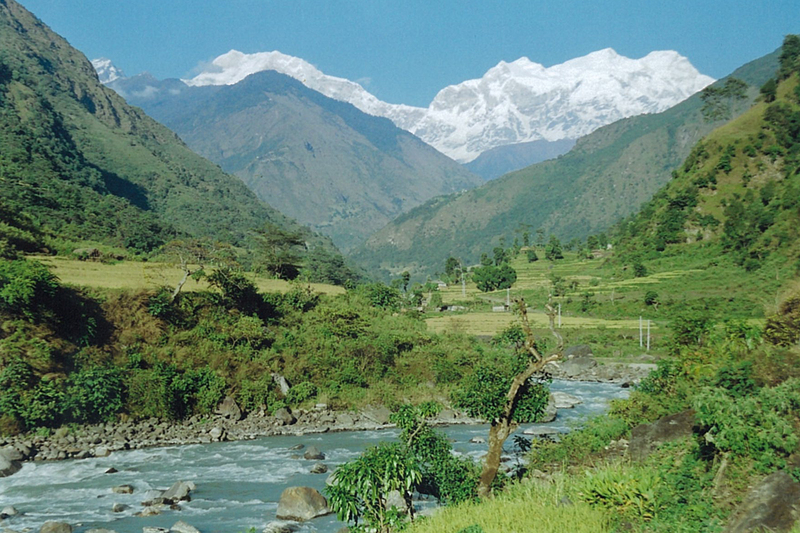 From here the trek moves gently upwards to Bahundanda, an attractive village in the saddle of a long ridge at 1,300m. (7 hour trek). Day 3 Bahundanda to Chamje (1,410m) We start the day by trekking down a steep slippery trail past amphitheatre-shaped rice terraces to a small hot spring and most of the rest of the day we hike along the river and its adjacent waterfalls. As we near the village of Jagat we have a steep 200m trek up to a trail that has been blasted out of the rock face and 15 minutes below this village we can visit another small hot spring. From Jagat we hike up to Chamje. (6 hour trek). Day 4 Chamje to Bagarchhap (2,160m) Today we make the 940m hike up to Bagarchap through bamboo and rhododendron forests on a trek high above the river bank. At 1,700m we hike past the village of Tal at the foot of a large waterfall before crossing a broad, flat valley that was once a lake (Tal means lake). After this we cross the Marsyangdi via a 60m long suspension bridge and trek up from a second suspension bridge to a stone kani (an arch over the trail), which marks the entrance to Dharapani (1,960m). All old villages from here to Kagbeni have these arches and they become more elaborate and picturesque as the Tibetan influence becomes stronger. The trek slowly climbs from here through a forest of blue pine, spruce, hemlock, maple and oak to Bagarchhap. 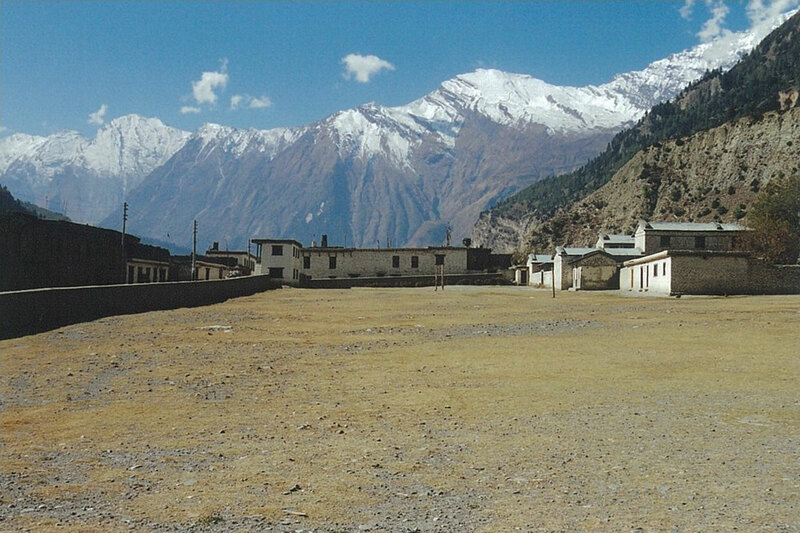 This is the first village on the trek with typical Tibetan architecture; closely spaced stone houses with flat roofs piled high with firewood. (7 hour trek). Day 5 Bagarchhap to Chame (2,170m) We first trek along the south bank of the river climbing to Syal Khola (the river of jackals) at 2,210m, from which we cross the river over a cement bridge near a spectacular waterfall. 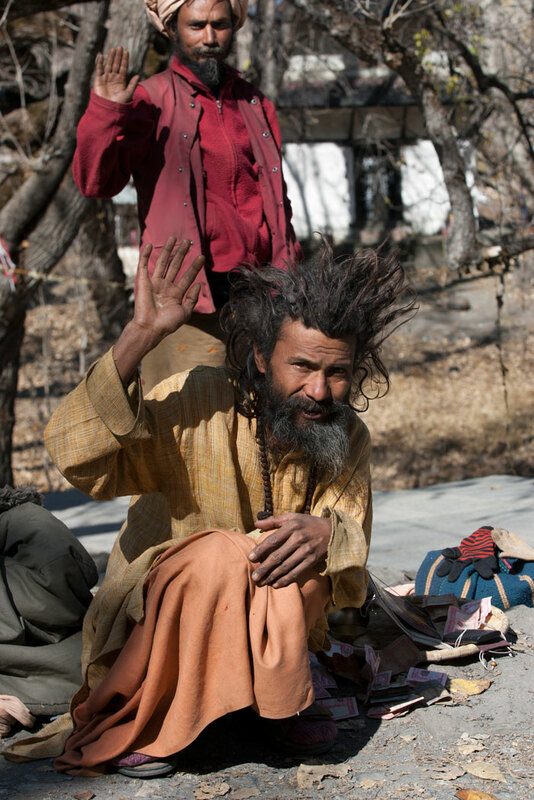 The trek crosses several landslides as it works its way uphill through a walnut tree forest and past apple orchards until we arrive at Chame, at the entrance of which is a long wall with many prayer wheels. Throughout the day there are views of Lamjung Himal, Annapurna II and Annapurna IV (7,525m). (6 hour trek). Day 6 Chame to Pisang (3,190m) We first trek up to Telekhu (2,840m) and continue with a long, pleasant and mostly level hike through the forest to Brathang (2,950m). After the trek rounds a bend we see the first view of the dramatic Paungda Danda rock face, a tremendous curved slab of rock rising more than 1,500m from the river. We cross back to the south bank of the Marsyangdi via a suspension bridge at 3,080m and then make a long gentle hike over a ridge through blue pine forests. After this the trek will be reasonably level as it heads toward Pisang. (5 hour trek). Day 7 Pisang to Manang (3,540m) Today our trek slowly and spectacularly climbs up to the Tibetan-style village of Braga (3,470m), where we can see houses stacked one atop the other, each with an open veranda formed by a neighbour’s rooftop. The gompa, perched on a high crag overlooking the village, is the largest in the district and has an outstanding display of statues. 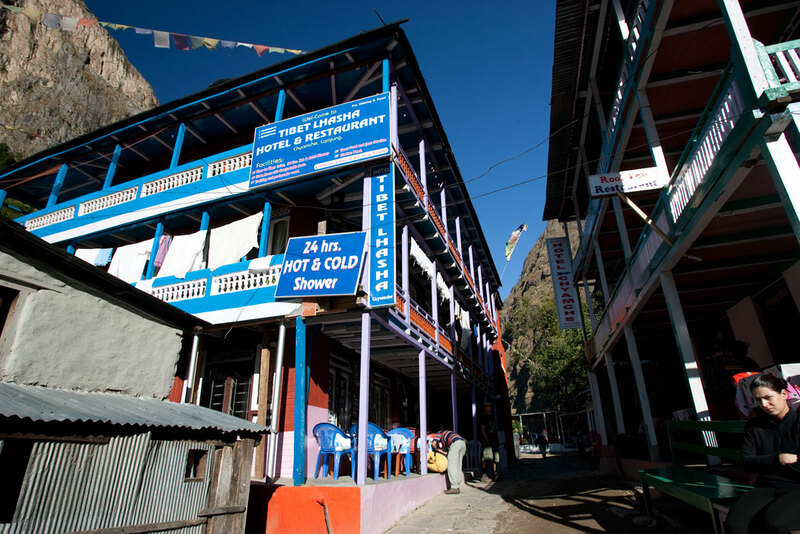 We then hike on through a very arid countryside, dominated by weird cliffs of yellow rock, eroded into dramatic pillars alongside the trek to reach today’s destination, the village of Manang, where the shops are surprisingly well stocked with all the things you might want to refuel on. (5 hour trek). Day 8 Rest Day Today is an acclimatization day though we could do a side-trek to, for instance, Khangsar. 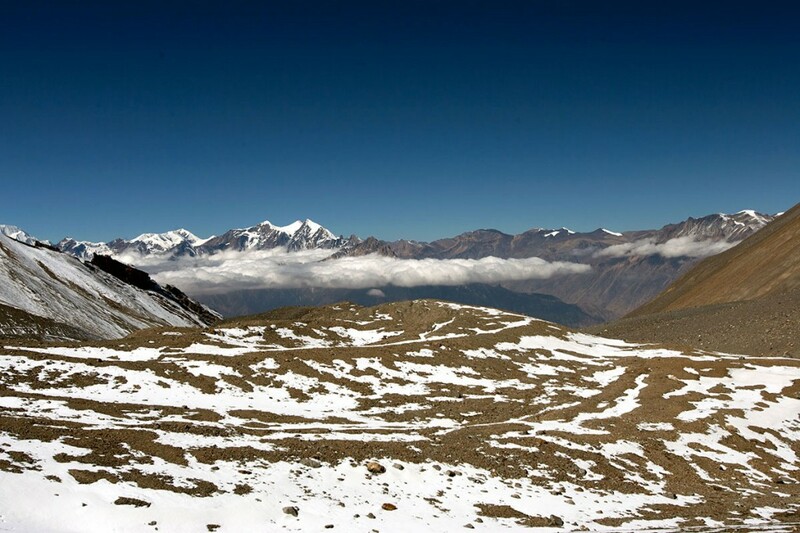 It is important to stop for a day to allow your body to acclimatize to the higher altitudes and thinning air and it also gives us the chance to distribute some money to the locals to wash some of our clothing. Day 9 Manang to Letdar (4,250m) Trekking slowly upwards to Thorung La we leave the large trees behind and see vegetation consisting mainly of scrub juniper and alpine grass and we hike past meadows where horses and yaks graze. After hiking to Yak Kharka (meadow) we should see herds of blue sheep grazing the steep slopes and after about 1 hour’s trekking we arrive at Letdar. (4/5 hour trek). Day 10 Letdar to Thorong Phedi (4,450m) (or Thorong High Camp (4,925m)) Again a relatively easy trekking day to get used to the altitude before we hike over the highest point on the trek. 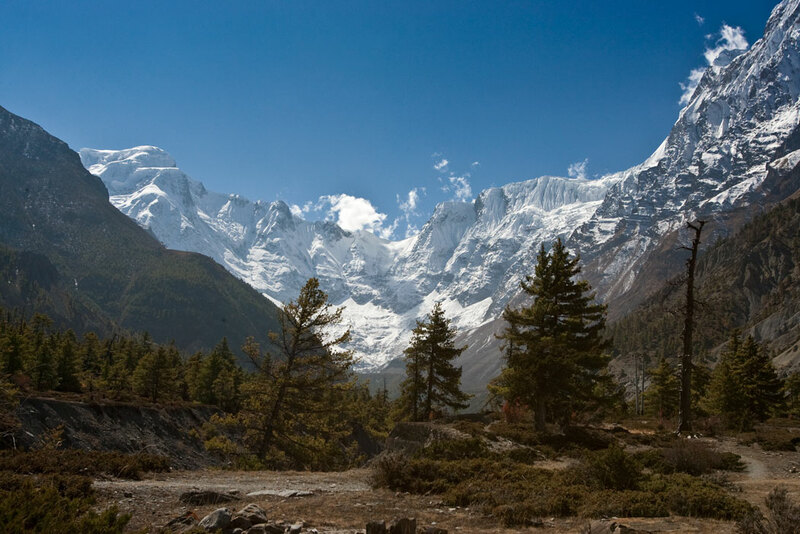 From Letdar we will continue to trek up along the east bank of the Jarang Khola to Thorong Phedi, a rock-strewn meadow surrounded by vertical 4,420m cliffs where blue sheep and even snow leopards can sometimes be seen. High in the skies above us we can see lammergeiers and Himalayan griffons circling. (3/4 hour trek). Day 11 Thorong via Thorong La (5,416m) to Muktinath (3,800m) Today is a long trek starting before sunrise at maybe 5am to reach the la (pass) by 10/11am at the latest, as we can be exposed to strong winds if hiking across too late. Local people have used this route for hundreds of years to bring herds of sheep and yaks in and out of Manang, thus the trek, while often steep, is well defined and easy to follow, though the many false summits mean the hike seems to go on for ever. Snow can block the pass at any time of the year, though this is rare and least likely in October or November. 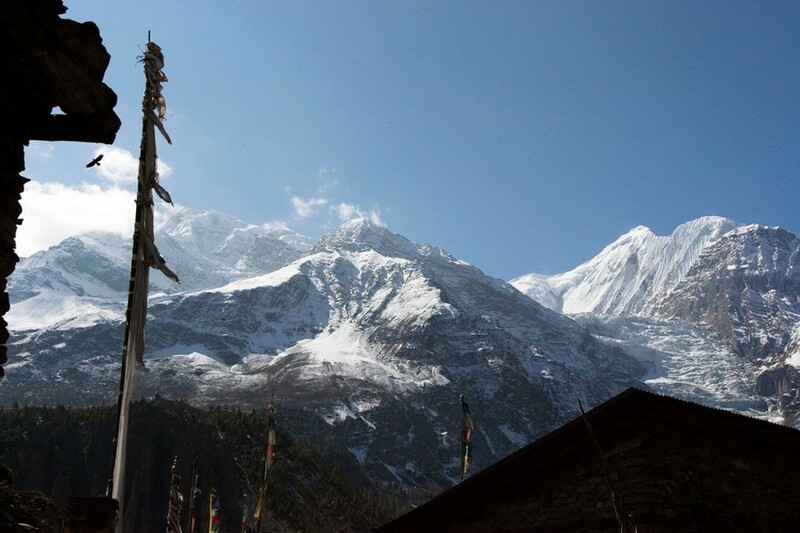 At Thorong La, with its traditional prayer flags and stone cairn, the views are outstanding. Here you can see the Annapurnas, Gangapurna and Khatung Kang, a heavily glaciated peak and, amazingly, there is a tea-shop on top of the pass! From here we start a long hike down of about 1,600m with great views of Dhaulagiri standing alone in the distance across the valley. 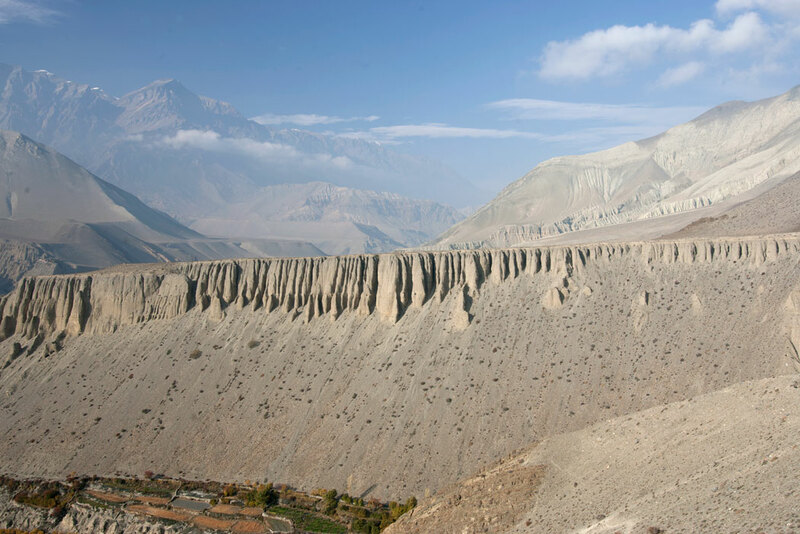 The trek becomes less steep as we enter grassy fields and hike across meadows to our destination of Muktinath, place of Nirvana, home to the Muktinath Temple as well as several monasteries. It is said that all the sorrows that you feel are washed away when visiting the temple, a scared pilgrimage site for both Hindus and Buddhists. The temple is dedicated to Lord Vishnu and has 108 waterspouts around it from which holy water pours and the main pilgrimage normally takes place in September. Another attraction nearby is the Jwala Mai Temple and this contains a spring and an eternal flame fed by natural underground gas. (9 hour trek). 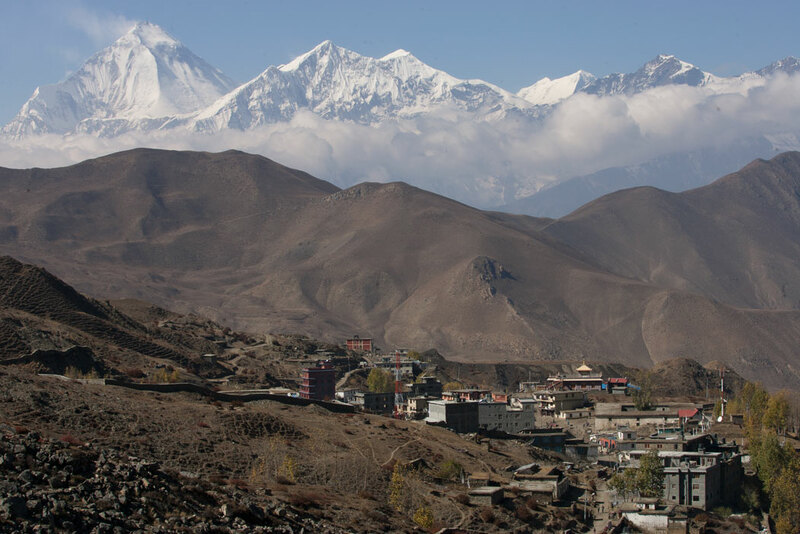 Day 12 Muktinath to Jomsom (2,665m) We make a 1 km hike (not forgetting to take admiring glances back over our shoulders) through meadows, streams and fruit orchards down to Kagbeni, a fascinating medieval village infused with Tibetan culture. 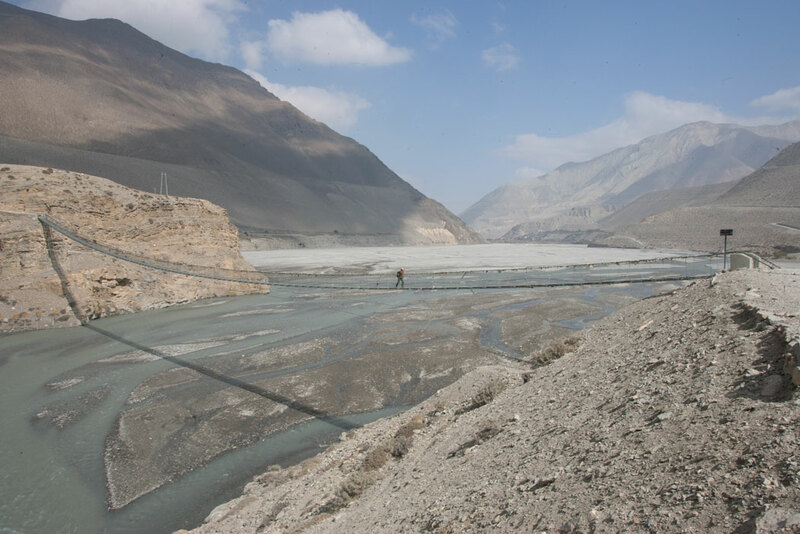 Then we trek on down the Kali Gandaki Gorge to Jomson. 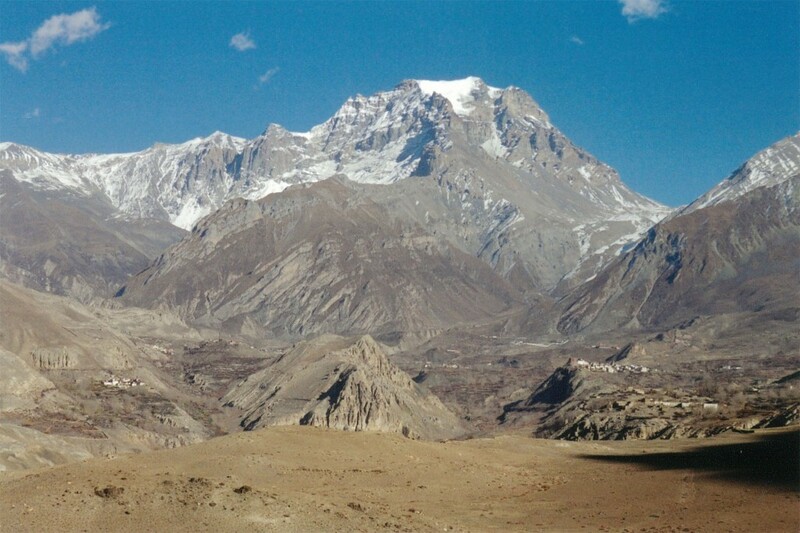 We could do this stage of the trek in 2 days (stopping in Kagbeni) allowing us the chance to both visit the temples at Muktinath and explore local hamlets as we progress. In addition the hike from Kagbeni to Jomsom can get windy in the afternoon, it’s best done in the morning. (6 hour trek). Day 13 Jomsom to Pokhara We fly to Pokhara. Here you might consider a paragliding flight with or without an instructor. Tandem flights cost from US$ 95 to US$ 130. Day 14 Pokhara to Kathmandu We return to Kathmandu. Price US$ 1,175 including both the short flight (US$ 113) from Jomsom, most peoples’ final destination on the trek, to Pokhara, travel to and from Kathmandu by bus and one night in Pokhara. If you wanted to save some money the flight could be replaced by a hair-raising all day bus journey. Price includes Airport pick-ups and drop-offs. All inclusive trek costs; accommodation in twin shared rooms, breakfast, lunch, dinner, trekking and park permit fees, guide and necessary porters and all their costs such as transportation, accommodation, food, equipment, insurance etc. Price excludes Accommodation and food in both Kathmandu and Pokhara, more than one night in Pokhara, alcoholic beverages, tips, your insurance and personal expenses.